Show Hours: Thursday-Saturday 10am-6pm, Sunday 10am-5pm. 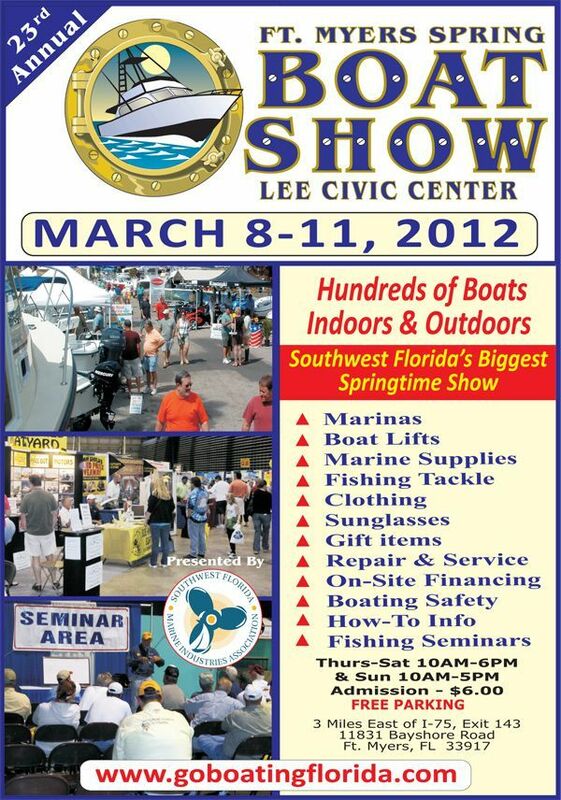 The 23rd Annual Fort Myers Spring Boat Show runs Thursday, March 8th through Sunday, March 11th at the Lee Civic Center. One of three shows produced annually by the Southwest Florida Marine Industries Association, the show features new and used boats from the area’s major dealers. More than 300 new and used boats will be on display both inside the Civic Center and outside on the Civic Center Grounds. It’s not just boats. There will also be a wide variety of accessory displays inside and out. Everything from electronics, marine supplies, boat lifts and fishing tackle, to clothing and sunglasses. Come and join us at the show, we will have Grady-White, Robalo and Chaparral Boats on display! The weather is beautiful this time of the year so come and browse the selections of models! The Lee Civic Center is located on Bayshore Rd in Fort Myers, Florida. Directions to the event: Take exit 143 off I-75, Then head East on Bayshore Rd about 3 miles and the Lee Civic Center will be on your left (port side).